It’s #ReleaseDay ~ The Pirate Bride’s Holiday Masquerade by Cathy Skendrovich! Welcome aboard, Author Cathy Skendrovich. We’re super jazzed you’ve come to share your new release with us today. Holidays and pirates! What’s not to love, eh? And you’re bringin’ ’em both. Huzzah!!! Lady Cathy: Ahoy, and thank you for having me aboard, Lady Katherine! #SALE Buy The Pirate’s Debt and get The Pirate’s Duchess for FREE! The Regent’s Revenge Series takes place along the coast of Cornwall and Devon between 1807-1810. Picture The Princess Bride meets Robin Hood meets Poldark and The Jamaica Inn! Each book features a different hero wearing the Black Regent’s mask. The Pirate’s Duchess: When her husband crosses the line, staging his own death to protect her, a widowed duchess is caught in an intricate web of deceit. Now, an impending marriage to another man endangers her life, forcing her husband to reveal his darkest-kept secret… he’s a duke of a pirate out for revenge in The Pirate’s Duchess. The Pirate’s Debt: A hopeless gothic romance reader, Lady Chloe Walsingham is focused on finding her perfect hero as she boards a ship bound for Penzance. Nothing in her beloved books prepares her for the consequences of her actions, however, after Basil Halford, Earl of Markwick, seeking to earn back his honor by repaying his father’s debts, dons the Black Regent’s mask. Pirates have plenty of enemies, including those within their own trade, and sacrificing his heart to keep Chloe safe is the last thing Markwick is prepared to lose. The Pirate’s Duty: riana Thorpe is a smuggler’s daughter who risked everything to challenge her evil pirate brother and save a lady and her maid from his wrath. Determined to atone for her brother’s villainy, she distributes his blood money to widows and orphans living nearby. When threatening letters arrive with the promise of retaliation, it will take a man like the Black Regent, a former navy captain in disguise, to protect the beautiful innkeeper who saved his sister’s life. Together, they will face a pirate demon and take the greatest risk of all—falling in love. Ready for a new swashbuckling pirate romance read? Here’s one HOT off the galley stove by author T.M. Franklin’s Cutlass! Enjoy! An attraction they both try to deny. Convinced One-Eyed Jack Tremayne killed her father and stole his prized cutlass, Sarina Talbot sneaks aboard the pirate’s ship to exact her revenge. To her surprise, she’s met by a declaration of innocence and an offer of help. She doesn’t trust him, and he doesn’t trust anybody. But they need each other to catch the killer and beat their enemies to a hidden cache of Aztec gold. They’re not the only treasure-seekers, however, and there’s a traitor in their midst. Caught between Crown ships and enemy pirates, Sarina and Jack discover a prize greater than gold as their uneasy alliance leads them on the adventure of a lifetime. Pirate Language in Georgian, England via Historical Hussies! I’m blogging at Historical Hussies today! Writing historical romance is a gratifying experience that can oftentimes be difficult too. An author makes choices that help modern readers understand the way people spoke in historical times, but must also season the story with historical words that transport readers to that era. Which words to use and when to use them? Well… that’s a talent every writer must master. Fortunately, several books are available to help authors achieve storyline Zen. Most Regency authors tackle stories of the upper crust. Who doesn’t love daring and dashing dukes, marquises, or earls who champion the day? Even historical aristocrats spoke in gentleman’s code. Several of my favorites include ‘Banbury stories’ (falsehoods), ‘befogged’ (confused), ‘dicked in the nob’ (crazy), and ‘land a facer’ (punch in the face). Read the rest of this great list of Georgian and pirate cant at Historical Hussies! I adore new beginnings! For instance, today is Monday, the start to a new week. Even better, in 8 days my pirate romance, Duke by Day, Rogue by Night will relaunch with a new book cover, fresh editing, and a new publisher, EsKape Press. (That’s March 11th to them what knows!) Woot!!! What could be sweeter, eh? “I love it when the rum isn’t gone,” he says, sauntering off. Moving his fingers like this. Why are we so high-spirited this morning? Today, my website has a brand new look!!!!! The barnacles have been scrapped off and new paint applied. Yes! My uber-talented darling youngest daughter, Juliana Bone, Graphic Designer extraordinaire, has redesigned my website! And one of the greatest things about this new design? Besides the uber goodness? You can now find me in one place! Yes! And one I’ll keep. Oh, what a joy it is to be a romance author. The best part is sharing my blog and stories with you, me hearties! Oh, Jack! Let’s toast our new epic journey together. Meanwhile, I hope you’ll take a look around, me hearties, at: http://www.katherinebone.com. ARRGH! Me Writing Process Blog Tour Ondits! Arrrgh! I’ve been tagged by the delightful Coco Rousseau who surely knows how to live writing romance novels in her penthouse apartment on Avenue des Champs-Élysées. Isn’t that the writer’s life, me hearties? Writers are an interesting bunch, aren’t they? Nomads of the mind, writers cherish the written word and dedicate time to making every word sing a magnificent symphony. Is there any one process that makes a writer more successful than another? Unfortunately, the answer is “no”. Writing process is as individual to an author as a fingerprint. What worked for Kathleen Woodiwiss when she created epic historical romance, in the 80’s, doesn’t work for Stephen King, the grand master of horror today. Voltaire did it drinking 70 cups of coffee a day. Jacqueline Susann typed each draft on different colors of paper, yellow for 1st, then blue, pink, and finally white. Charles Dickens slept facing north and wrote facing north to channel the magnetic currents affecting energy levels. Raymond Carver wrote in his car. Virginia Woolf wrote standing up. Marcel Proust wrote from bed, swaddled in blankets, gloves, and scarves, in a room lined with cork. Because I write historicals, there is research to do on period fashion, location, historical background, plus flipping through various name source books for the perfect era match. Names are like character fingerprints. When the right one is found, characters jump right off the page. 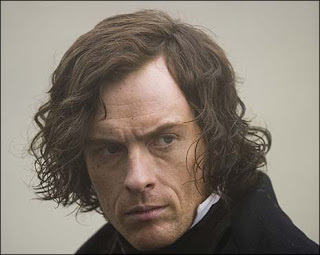 (Behold that character sketch of Toby Stephens is now the inspiration for Lord Simon Danbury.) It’s at this point in my writing process that I create a storyboard and a story journal (my Captain’s log). While my stories come to me in film reels, storyboarding brings my characters to life in ways I’ve never been able to define. Once my storyboard is done, and character sketches are written in my captain’s log, the sails fill and the journey to adventures begins. What am I working on? 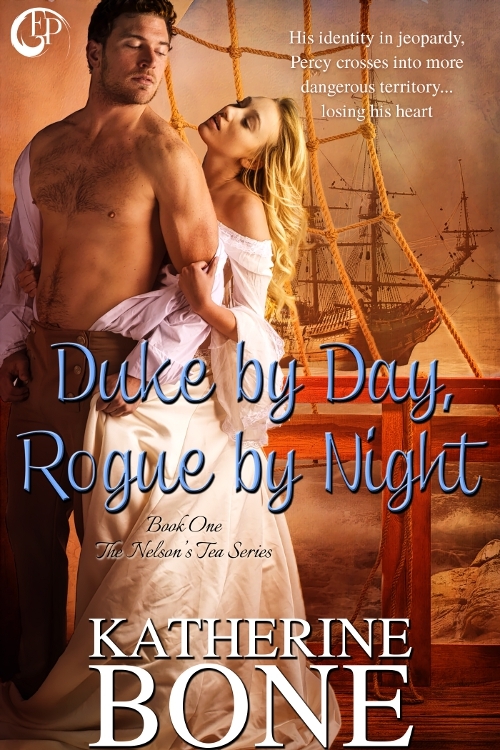 With the relaunch of the 1st book in my Nelson’s Tea Series, Duke by Day, Rogue by Night, on March 4th, I’m finishing up the prequel novella to the series, My Lord Rogue. 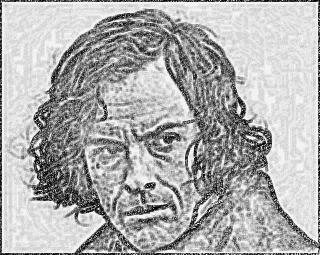 In My Lord Rogue, Lord Simon Danbury joins forces with Admiral Horatio Nelson to put together a clandestine force of 1st sons to protect England’s shores from French invasion. But an assassination attempt threatens to end Nelson’s Tea before it even begins, forcing Simon to team with Baroness Chauncey, the woman he previously cast aside. In honor of writing processes that yield magnificent books for readers across the globe, I’m tagging three authors I admire from varying genres for next week’s continuing blog tour. Collette Cameron: When she’s not teaching or writing historical romance, Collette enjoys amateur photography, bird watching, gardening, interior decorating, rock-hunting, or salmon fishing on the Columbia River. Debra Glass is the author of over thirty-five books of historical and paranormal romance, non-fiction, young adult romance, and folklore. Carla Swafford is a lithe twenty-nine year old with long auburn hair and sparkling dark eyes who loves dancing with her gypsy friends. Geez! Can you tell I love writing fiction? Now for the real stuff. I’m married to my high school sweetheart and live in Alabama. My stories are more exciting. Live life to the fullest no matter what process fills your sails. And never, never, never give up! If you’re a reader, is there a writing process you’re curious about? If you’re a writer, what process do you use to get you to that coveted horizon? 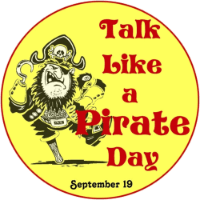 Talk Like A Pirate Day!!! Love me some pirate slang, don’t you? I wrote a fun blog at www.southernmagic.org and www.romancemagicians.blogspot.com on September 3rd about pirate slang. You could go back into the archives and check it out. What ones do I love to use on a daily basis? * Ye scabberous dog, ye! ~ When a crewmate has gotten on me bad side. Or me scoundrel of a dog has wrecked me cabin. * Arrrr and Tarrr!!! ~ Just because it’s a combination of a greeting, surprise, and curse all in one. * Scallywag! ~ A gent what’s been entertaining trouble and needs his rum rationed. * Love ya, ye swab! ~ A term I adore using with me favorites… aka. me crew. * Pilfer me weasely guts out. ~ Sick as a dog. As I was a week ago. Not a pretty sight me hearties. Here be just a few of me favorites, lads and lassies. What use of pirate speak do ye prefer? Stay tuned for more this next week. I’ll have pirate recipes and giveaways galore, all the way through September 28th! That be treasure for them what follows the code. Wishing ye fair skies and calm seas!